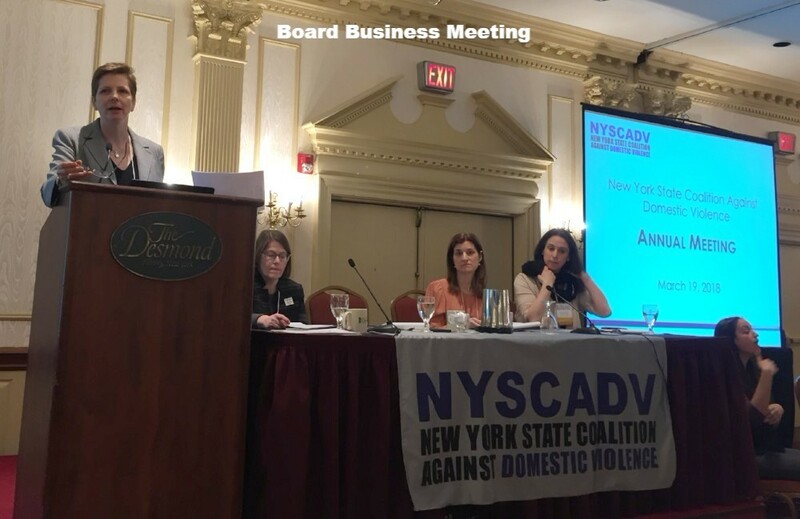 On Monday, March 19, 2018, the New York State Coalition Against Domestic Violence (NYSCADV) held its annual membership meeting. This was an occasion for the Coalition members, partners, and friends to discuss the work they are doing to respond to and prevent domestic violence as well as learn, share, educate, and motivate one another. After a welcoming message from Board Chair Ann Ellsworth, the board members held a business meeting during which they reviewed and approved the meeting minutes from the 2017 Annual Membership Meeting. Board members also went over the annual financial report of the Coalition and discussed the Regional Advisory Council as well as shared other important news. After the business meeting, NYSCADV staff presented a review of 2017 highlights and achievements. 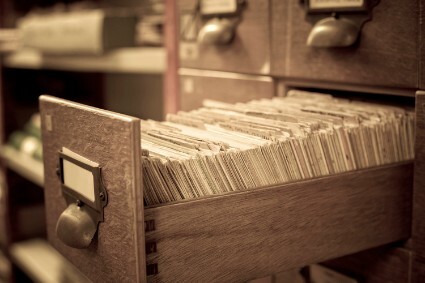 This included the variety of trainings and webinars provided, and legislative advocacy efforts and the various pieces of legislation that are of interest to the Coalition. 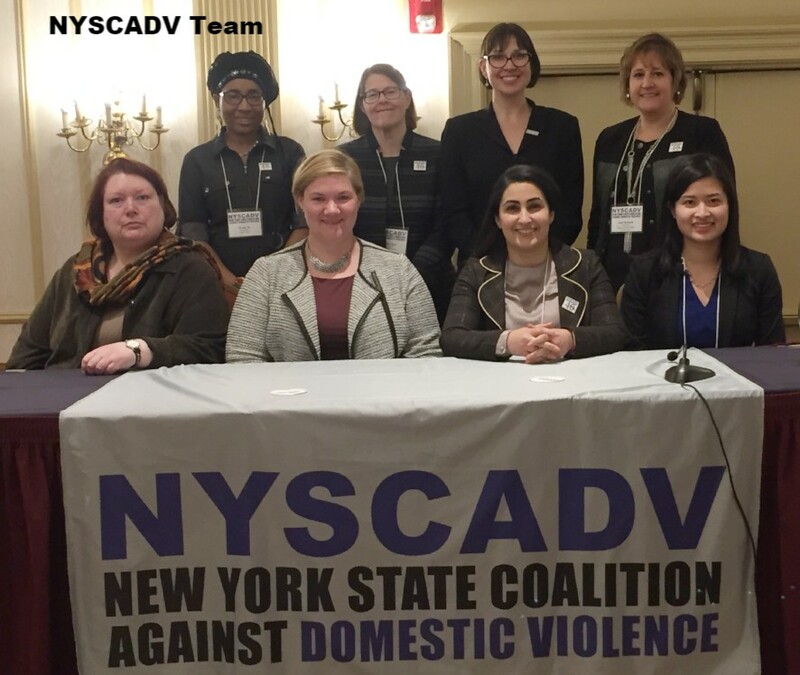 Additionally, the staff presented on the online resources available on NYSCADV’s website that can boost advocates’ work in helping survivors. This year’s annual meeting included two keynote presentations. The first speaker was Kelly Miller, Executive Director of the Idaho Coalition Against Sexual and Domestic Violence and an alumni cohort member of the Move to End Violence, a 10-year nationally recognized initiative of the NoVo Foundation designed to strengthen the collective capacity to end violence against girls and women. 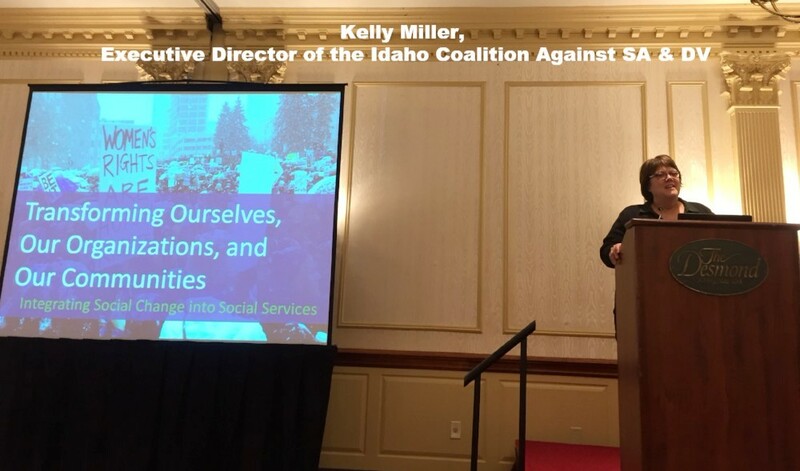 Kelly’s presentation, “Transforming Ourselves, Our Organizations, and our Communities,” focused on the work her coalition and community members are doing to put an end to violence. Kelly discussed the systemic injustice that exists in our society, how we can question it, and partake in change through our work to end domestic violence. She further invited participants to appreciate the value of their work by leading an exercise that encouraged networking and small-group discussions of everyone’s activities and achievements. 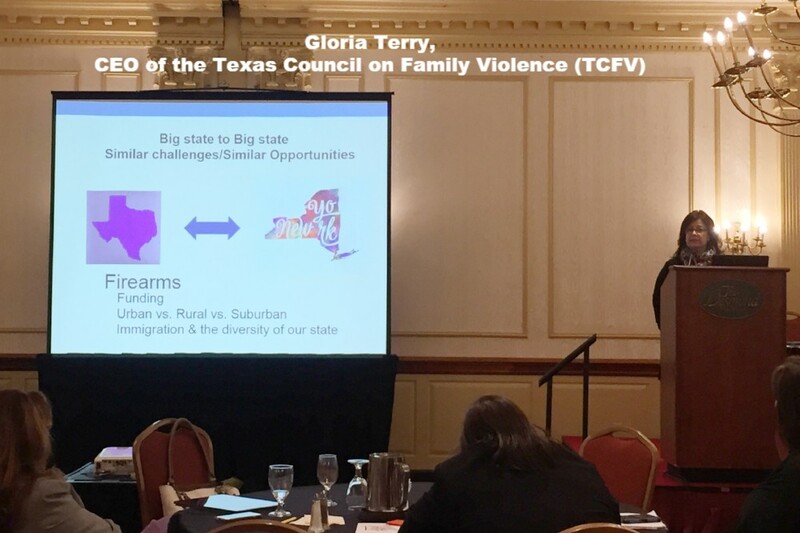 Gloria Aguilera Terry, CEO of the Texas Council on Family Violence (TCFV) presented the second keynote presentation of the day. In her role as CEO, Gloria guides and directs the statewide legislative activities of TCFV, establishing and fostering statewide tactical partnerships, working with staff to provide outstanding services to programs and strategically positioning TCFV to create the influence necessary to continue serving the needs of victims and their families. In her presentation, “The Future of The Coalition,” Gloria asked participants about the difficulties they face in their work to prevent and end domestic violence as well as serve survivors. She also highlighted the similarities and the differences that exist between Texas and New York State. Additionally, Gloria invited the participants to think of innovative ways and solutions that can boost their work as well as ways to engage people not specifically involved in domestic violence advocacy. After the keynote presentations, a panel on the “Best Practices for Serving Immigrant & Undocumented Survivors” was presented by Cecilia Gastòn of Violence Intervention Program, Alena Victor of Womankind (formerly New York Asian Women’s Center), and Isabelle Thacker of The Legal Project. Cecilia M. Gastón, Executive Director of the Violence Intervention Program since 2008, has a strong track record of service to disenfranchised groups, especially in the Latina community. Cecilia discussed “ICE Enforcement and the Risk for Immigrant Survivors.” She educated the audience about immigrant populations and what difficulties they face. Cecilia also talked about the different immigration laws and deportation and how they impact the lives of immigrants and undocumented survivors. 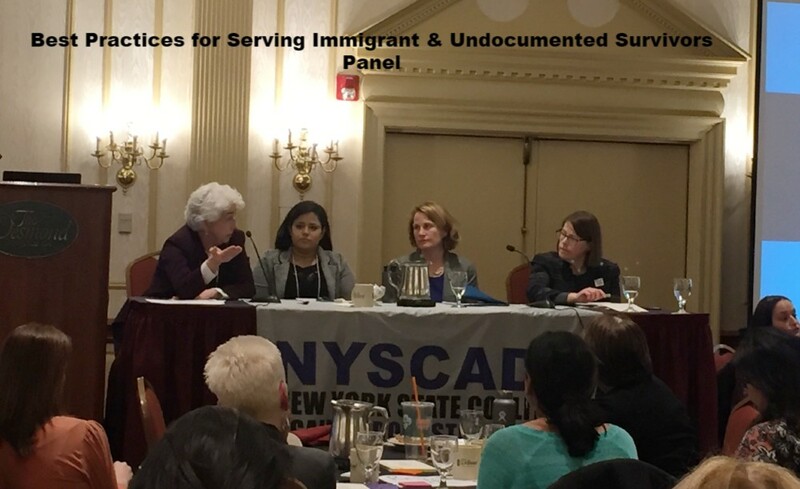 She further discussed the difficulties that undocumented immigrant survivors confront and how their status may prevent them from seeking domestic violence services. Alena Victor, Director of Residential Programs with Womankind (formerly New York Asian Women’s Center,) has been in the field of social services since 2005. Alena’s presentation was on “Working with Immigrant Survivors.” Alena shared some of the difficulties her organization faces while striving to serve immigrant survivors. She talked about how immigrant status, religious and racial discrimination, and language constitute barriers for immigrants seeking domestic violence services. She also shared some best practices and strategies that advocates can incorporate into their work to best serve immigrant survivors. Isabelle Thacker, Immigration Attorney at The Legal Project, handles a variety of immigration cases with an emphasis on helping survivors of domestic violence and human trafficking. Isabelle’s presentation was on “Legal Remedies for Immigrant Survivors.” She enlightened participants about people who are impacted by immigration laws and the kinds of immigration status. Additionally, Isabelle talked about the different documentation that immigrants can hold depending on their status. In her knowledge as an immigration attorney, she explained how the Violence Against Women Act (VAWA) applies to immigrant survivors and the potential consequences that applying for an order of protection may have on survivors. This year’s Annual Membership Meeting provided attendees with useful information on a number of topics, including best practices for ending violence and achieving social justice in the hope that this shared knowledge will support and reinvigorate the work we do as advocates and allies each day. NYSCADV’s 2018 Day of Action will be held on Wednesday, May 9, 2018.